The CareGiver Partnership: After a slip on ice and a small head injury, Arthur was closer to death than he knew. After a slip on ice and a small head injury, Arthur was closer to death than he knew. of both fatal and nonfatal injuries among older adults. My friend’s father, Arthur, is a robust 72 year-old man, a recently-retired professor with a lifetime of research in Africa and Latin America behind him. 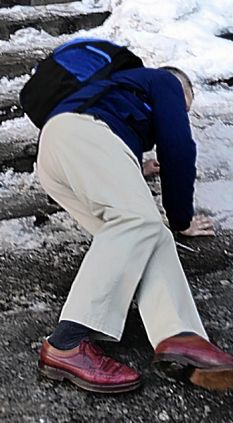 He assumed that in retirement, he still had some of his best years ahead of him, but one small slip off his icy porch almost put an end to his life. We all live in a quaint central Pennsylvania college town where winter brings a damp, icy covering to the world. Arthur was headed out to an evening college function as the sun slowly set in the cloudy late afternoon sky. He stepped out his front door, onto his porch stairs, reaching back with his key to turn the lock. The next thing he knew, he was waking up in pitch darkness, face down in the snow at the bottom of his stairs in a frozen pool of his own blood, with his nose broken and left leg immobile. That fall could well have ended his life. 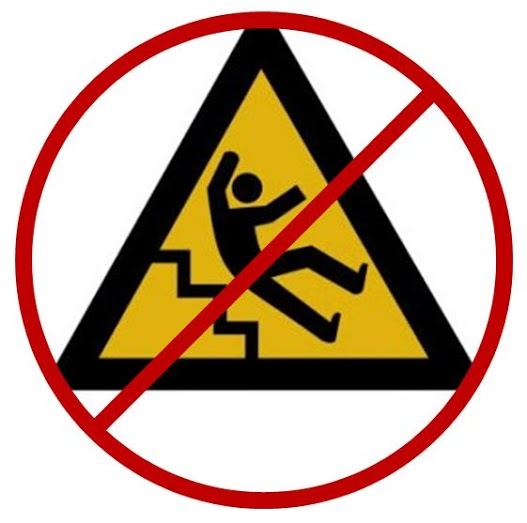 The CDC reports that in 2011, about 22,900 older adults died from unintentional fall injuries. Arthur was relatively lucky. He broke his knee and worse, sustained a concussion, that had he not received immediate medical attention, could have led to brain damage, strokes, and even death. Unfortunately, Arthur’s story is not an uncommon one. According to the National Floor Safety Institute, half of all accidental deaths in the home are caused by a fall. Most fall injuries in the home happen at ground level, not from an elevation. are caused by a fall. 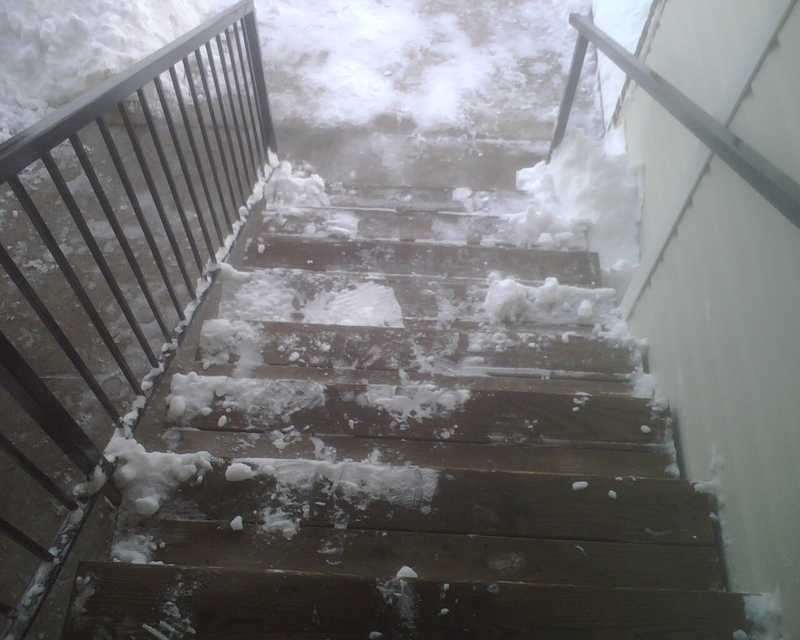 The stairs, decks, front porches, breezeways and other entries into our homes can be some the most dangerous places in our worlds in wet and icy conditions. According to the CDC, such falls are the leading cause of both fatal and nonfatal injuries among older adults. Immediately after his fall, we installed no-slip surfaces on his porch and outdoor stairs. We chose Handi-Ramp’s Handi-Treads for their longevity, easy installation, and long-term cost effectiveness. Non-slip tapes like Skid-Guard Safety Tape or paints like INSL-X Sure Step are other options. We installed them at our houses as well, to protect our children and wives from similar falls. There are some basic precautions that can be taken to make these potentially dangerous and heavily-trafficked areas of our homes significantly safer. 1. Always Look Where You’re Going - If we typically focus far ahead and are not mindful of the ground or the immediate surroundings, we could miss warning signs that are right in front of us. Be extra careful when conditions are wet or icy. Always look where you're going. 2. Wear Weather-Appropriate Shoes with Tread - Always wear footwear that is comfortable, weather-appropriate, and has tread to maintain traction on slick or unstable surfaces. 3. Protect and Fortify your Home Environment - While we cannot always control the safety of all our surroundings or public areas, we can control the safety of our own home. Make sure that the outdoor stairways, walkways and any potential risk-areas are safe for everyone in your home, in every weather condition. Non-Slip Tape like Skid-Guard Safety Tape: The tape is rolled out and sealed to surfaces, cost on average $9 per stair with materials and labor, and lasts about 6 months. The tape uses ‘grit’ to provide traction and stability, but easily wears out and loses traction after extended uses. A quick and cheap solution in the short run, but one that requires constant upkeep and is expensive over time. Non-Slip Paint like INSL-X Sure Step: The paint is typically used at industrial facilities, costs about $40 per stair with materials and labor, and retains the non-slip capabilities for about 2.5 years. It also relies on ‘grit’ to create traction, and with increased foot traffic begins to chip, crack and lose traction. Convenient for covering large concrete surfaces, but relatively costly and requiring regular upkeep. Better for industrial than home uses. Non-Skid Treads like Handi-Ramp Handi-Treads: The treads are grip-surface aluminum plates that you screw to each stair or surface. Cost $12.70 each, and they last about 20 years. HandiRamp’s products are made of corrosion-resistant aluminum, feature raised buttons to provide traction, and withstand even the harshest conditions. The raised buttons and corrosion-resistant surface enable it to not wear out from foot traffic or weather, and they are available in customizable sizes for indoors or outdoors. For homes, Handi-Treads are very affordable, simple to install, and will probably last as long as you own your home. Each day we risk being blind-sided by a fall, and our older loved ones with impaired mobility are at an even higher risk with a greater potential for injury. With inclement weather bringing slick conditions we cannot always foresee a fall, but we can take measures to prevent them. If we had thought to fortify the stairs before, it is likely Arthur would likely have never suffered that fall last winter. With the technology and equipment available to us now however, we can do our part to improve our home environment and protect the safety of our loved ones. It is inexpensive, easy, and fast, and very much worth the peace of mind it provides.